Travel through one of the most spectacular railway routes, declared a World Heritage Site by Unesco, aboard the famous Bernina Express. The Bernina Express is a direct train from Chur to Tirano in Italy. It crosses from north to south, the beautiful canton of Graubünden. Chur to Tirano is the classic route, however; in Summer, there are more options. 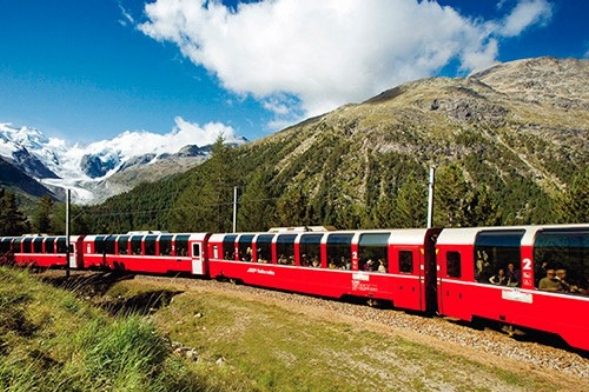 There is a Bernina Express that departs from Davos and St. Moritz as well. All trains have in common that they cross the Bernina Pass and end in Tirano. The journey from Chur takes about 4 hours. From Davos, 15 minutes less and from St. Moritz, about 2 hours, and does not include the north of Graubünden. The Bernina Express route is an impressive piece of railway engineering. Cross the Engandina by touching the highest point “Ospizio Bernina” reaching up to 2,253 meters high. 61 km of spectacular alpine crossing between snowy peaks and places where nature and culture merge. It passses through lots of spiral loops, 55 tunnels and 196 bridges. The landscape varies greatly, from high alpine scenery on the Bernina Pass to Mediterranean scenery in the Poschiavo valley to Tirano. From Premium Incoming, we encourage you to experience this magnific scenic route through the majestic Swiss Alps!